Japanese Episode AG 116: "Konsen Konran! 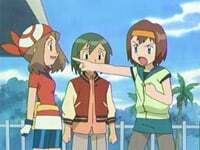 Pokemon Kontesuto - Kinagi Taikai (Zenpen)"
American Episode 387: "Mean with Envy"
Our heroes have arrived in Kinagi Town, where Haruka is training for the upcoming Pokemon Contest. As Haruka trains, Satoshi also begins to teach his Yukiwarashi how to control its Ice Beam attack. The ice pokemon's attack causes a disruption that causes everyone in the area to start running, including an Aipom that's caught Eneko's attention. Haruka's pokemon begins to chase after the pokemon, leading its trainer toward a house occupied by a Coordinator named Toshiki. Haruka and Toshiki start to get to know one another when a girl named Eriko interrupts them, angry because she thinks a compliment from Toshiki meant for Eneko was directed toward Haruka instead. She doesn't like how Haruka is getting close to "her" Toshiki and declares that only she and Toshiki are allowed to win the Pokemon Contest. The Rocket-Dan appear and try to steal everyone's pokemon, but Haruka's Wakashamo and Toshiki's Hellger work together to defeat them. Seeing the two Coordinators working so well together infuriates Eriko even more, so she resorts to insulting Haruka by telling her that her Eneko's Cat's Hand attack ("Assist") is too random to rely on. Haruka takes offense to this and decides to use Eneko for the Contest while Eriko will use her Rougela. The Contest begins, and after a long Appeals round, the final four are announced: Musashinski (Musashi in disguise) and Eriko will face off in the semifinals while Haruka will face Toshiki. Haruka's final chance to earn her fifth ribbon is coming to a close; will she be able to defeat her rival? To be continued! Now this is the episode that's screwing everything up. Right here. About six years ago, a lady named Carole B. Weatherford wrote an article about how offended she was at the pokemon Jynx, upset at the fact that a character so racist could appear in a kids' cartoon. Maybe you've heard about it. Now as far as I know, she hasn't written anything about the pokemon since 2000, but the effects of that six year old article are still being felt in the pokemon fandom today. This episode, in which the TV series debuts the new, less racially offensive purple version of Rougela, was meant to show the world that Ms. Weatherford's complaints have been taken seriously. However, despite the fact that Rougela was turned purple for American audiences, the episode was skipped during the season's initial run in the US. This led many fans to believe that it was banned because it featured the pokemon, but when the network finally got around to airing the episode two months later, that theory went out the window. As far as the episode itself goes, it was another good one. Eriko is the second Coordinator in a row to hate Haruka (after Harley), and the triangle with Haruka and Toshiki is amusing to watch. We also get some great Nyasu/Persian rivalry here, and Nyasu's Appeals round is funny as well. Good stuff, good stuff. It's odd that Eriko is called Erika in the dub since that's also the name of a Kanto Gym Leader. Other that that, the only remarkable thing about the dub is that 4Kids keeps a piece of Japanese music that they've never kept before, even if it's only for a few seconds (it happens right before the Rocket-Dan perform their motto). Interesting. For April Fools Day 2006, I did a fake comparison that suggested that Kids' WB! edited Jynx out of the episode and replaced it with a Glalie. In case you didn't see it, go have a look here. Toshiki's Hellger keeps its Japanese voice. I don't remember if the pokemon's always had its Japanese voice, so that's why I'm mentioning it here. In the Japanese version, the shot of Musashi and Kojirou ordering their pokemon to attack, followed by a shot of Haruka covering her face as smoke billows in the background, is shown twice. Once before the commercial break, and once after. In the dub, the repeated footage after the commercial break is cut. When Yukiwarashi starts its Ice Beam training, we hear Ready Go! play in the background of the Japanese version. Bla bla bla, the dub replaces it, bla bla bla. And guess what? No TO BE CONTINUED... cut!